WHATS BETTER THAN TURKEY OVER THANKSGIVING? 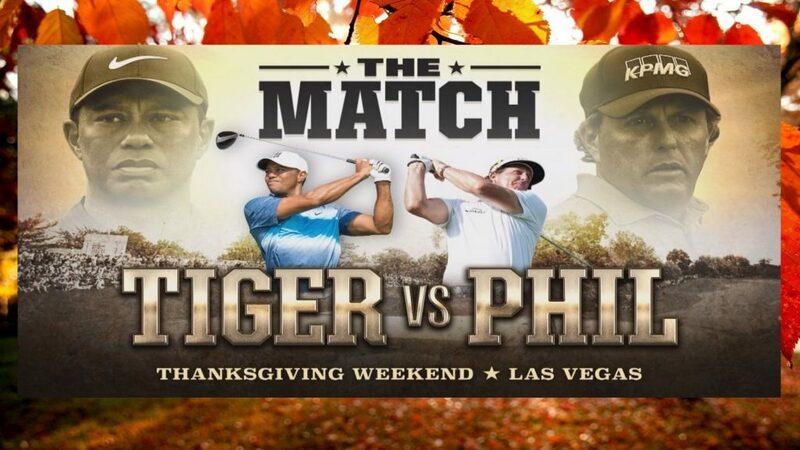 – A Match between Tiger and Phil! This year, Thanksgiving will have new meaning than just turkey, family, football and cold weather! The two most accomplished golfers of the past 25 years will face off in a match play event Friday at the exclusive Shadow Creek Golf Course in North Las Vegas. But in order to watch the winner-take-all $9 million exhibition, you’ll have to shell out $20 in the first-ever pay-per-view event for golf. The top pay-per-views in history have been dominated by boxing, with UFC and WWE also being major draws. Traditional stick and ball – or, in this case, club and ball – sports aren’t among the top 50 pay-per-view events in history as broadcast outlets have shelled out billions to keep them locked into their traditional spheres. The Players: Tiger Woods, 42 vs. Phil Mickelson, 48. Phil Mickelson (5 majors, 43 PGA Tour victories). Mickelson won the World Golf Championships-Mexico Championship. Those were the first wins since 2013 for both players. Shadow Creek Golf Course, a man-made marvel in the Mojave Desert that is as challenging as it is beautiful. The course, a par-72 that can tip out at 7,560 yards, features many risk-reward holes, a stout collection of par-3s and long par-4s with doglegs. From the day it opened in 1990, Shadow Creek Golf Course, the host of the mano-a-mano match between Tiger Woods and Phil Mickelson the day after Thanksgiving, was cloaked in mystique and shrouded in secrecy. From its eye-opening price tag — anywhere from $45 million to $60 million — to its location in the Mojave Desert 15 miles north of the Las Vegas Strip, to its esteemed clientele of high-rollers, captains of industry, sports icons and stars of the silver screen, Shadow Creek quickly became a bucket list dream for anyone who has put a peg in the ground. The course hasn’t lost any of its glamour, glitz or guts since its grand opening, and alongside Woods and Mickelson, it deserves its rightful place as a headliner for The Match. It’s a grand stage for the high-stakes battle between this generation’s best players and biggest stars, a man-made marvel of nature’s treasures that will challenge both players and stun onlookers. For a decade, one could only play Shadow Creek by invitation. But since 2000, when Wynn sold his holdings to MGM Resorts International, anyone can play the course. 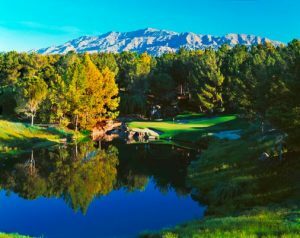 It’s a hefty price — one must stay at an MGM Las Vegas property, and the green fee is $500 plus gratuity for the mandatory caddie. 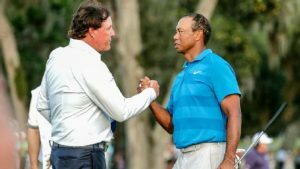 The competition, the side bets, the banter between Woods and Mickelson will highlight the pay-per-view telecast. As will Shadow Creek. Match play. Each hole is basically a tournament, as a player earns a point if he beats his opponent on the hole. The winner is the player with the most points at the end of play, which could be on the 10th hole if a player wins the first nine holes. Woods and Mickelson will raise the stakes as they will be making plenty of wagers throughout the match, with the winnings going to charity. Among the expected bets will be long drive and closest-to-the-pin contests. The players also will likely propose money challenges on putts and up-and-downs. The bets will likely be in the range of $10,000 to $50,000 per wager. Both Woods and Mickelson will be mic’d during the match. With no commercial breaks, there will be plenty of airtime to fill, and these two will certainly break out the needle. Their caddies Joe LaCava (Tiger) and Tim Mickelson (younger brother of Phil) will be mic’d. Drone coverage will create eye-popping aerial views of each shot, as well as highlight the golf course. The one-hour pregame show will feature Charles Barkley, Samuel L. Jackson and Pat Perez. Ernie Johnson of TNT’s NBA coverage fame will serve as the play-by-play announcer alongside Peter Jacobsen and Darren Clarke. Natalie Gulbis and Shane Bacon will be the reporters on the ground.